In Lucknow, households are getting smaller. The proportion of joint families and nuclear ones with elders has shrunk while nuclear families are going up. The average household size in last five years has gone down from 5.3 members to 4.9 members. The education profile of the city has not changed much over last five years. There is no major change in occupation and family structure as well. Skilled / Unskilled and petty trader constitute the bulk of working population. Share of businessmen has gone down while supervisory level occupation has gone up albeit on smaller bases. We see that there is no change in two wheeler’s penetration in Lucknow but four wheeler penetrations have grown at 12% annually. TV, which already had a high penetration level, has grown at less than 1% annually, but there is significant growth in satellite and DTH households. Print and TV reach has been stagnant over last five years. However cable and satellite reach has gone up from 52% to nearly 80%. This shows that even though there has been no significant change in TV viewers, there has been a rapid movement from non-cable viewership to cable. Internet is another medium which has shown significant increase. In the last five years, internet users base in Lucknow has more than doubled. 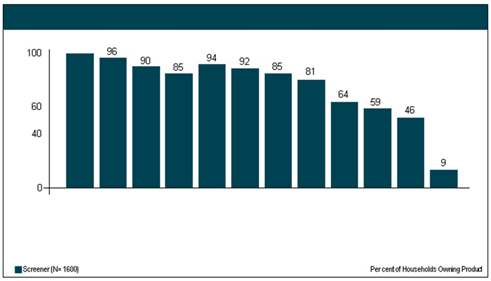 PC use has grown by more than three times, while internet access has gone up to nearly 10%. There seems ample opportunity for internet penetration in Lucknow. The trend in durable ownership clearly indicates that the living standard of Lucknow is improving rapidly. People are earning more and are moving towards a better and comfortable lifestyle. This observation provides enormous opportunity for marketers to woo consumers. Food items like noodles, jam, branded soup; cheese and readymade paste have registered double digit annual growth, indicating a shift in consumption pattern, where people are looking for convenient products to suit their busy lifestyle. This is really interesting news for fast food makers. Similar trend can be seen in baby care, household care and personal care products as well. The growth for four wheelers in Lucknow has been similar with other 1-4 million cities, however two wheelers continue to grow unlike Lucknow. Home entertainment and communication equipment are growing at a faster rate compared to other similar towns, however TV and C&S penetration is still lower compared to other 1 – 4 million towns. The trend is similar for other FMCG products as well. For most of the products Lucknow has registered higher growth compared to other cities in the same population class. 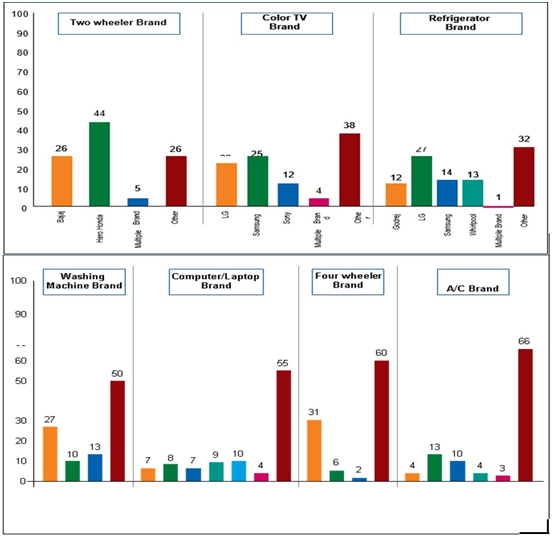 In Colour TV category, LG and Samsung are closest competitors in Lucknow. In higher income group, LG has more owners than Samsung, where as in middle income group it is the opposite. For people, who are graduate (general) the competition is close; whereas, for non-graduates Samsung dominates. Among businessmen, there is a close competition between LG and Sony. Among workers, LG is more popular whereas in business professional group it is the opposite. Computers/laptop is highly fragmented category with none of the single brand having more than 10% share in terms of ownership. While significant number of graduate professionals own Lenovo, some of the general graduates own Samsung. Also, many businessmen and mid-income people own Samsung. Most of low income people (with monthly income less than Rs. 25000) own brands other than Dell, HCL, HP, Lenovo and Samsung. It is mostly desktop/laptop that is owned, with less penetration of tablets. In terms of managing finances, savings accounts are the most preferred financial asset with less belief in bonds/ equity shares/MF. When CWE is a graduate (profession/ general), ownership of all goods is high, specially computers and cameras. The trend continues in financial assets with graduate CWE households owning fixed deposits, houses and RBI bonds. The story remains the same with worker/trader/shopkeeper community lagging in investments. Salaried people invest the most specially housing and insurance. Working people have higher preference for savings accounts as well as credit cards. Very few housewives own credit cards while most graduates have savings account. Fewer numbers of respondents intend to invest for mutual fund units. While tracking investments, we find that businessmen and salaried people intend invest in higher education for family member in comparison to percentage of workers. Percentage of graduated professional who intend to buy higher education of a family member is more than percentage of people who are either graduates or graduate in general. Salaried, professional graduates and higher income people are more interested to buy real estate property. Businessmen have more intention to invest in travel than salaried employees. On the one hand, many do feel that they would need more money to improve their quality of life, others feel that they have enough but a large proportion does feel that they would need money to gain experiences instead of acquiring more material things. Youngsters (especially those in 19-35 years) seem to be most comfortable handling information especially those who are heavy internet users. On the other hand, those who are heavy viewers of TV seem most lacking in time and energy. 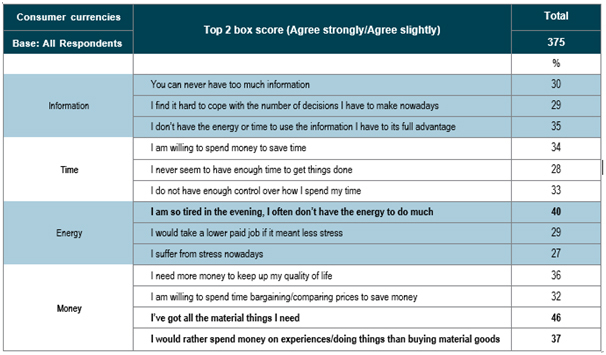 Married, female and household feel the need for more information but seem stressed and lacking energy to get the desired information. Those in 19-35, married, housewives, graduates/post grads and those who read newspaper (with 2 mobile connections) seem to be the most feeling deprivation of time available. They are willing to trade off money to save time and to find ways to take control of the time. As expected, those below 18 years are the ones with greater availability of this currency. More interestingly, we find demographics lead to inequality in the consumption pattern, investment option etc. As the consumption behaviour become more and more differed across demographics characteristics, it makes managers and researchers to grapple with the complex interplay between marketing practices and demographic characteristics. To ignore the fact that demographics characteristics influences marketing practice is synonymous to overlooking the reality that advertising influences consumer choices, or lower prices typically lead to higher sales, or higher satisfaction typically leads to more committed buyers. The challenge is apparent—consumer demographics is a factor both researchers and managers must become cognizant of in trying to understand buying behaviour. Finally, we have tested association of selected demographic characteristics of consumers with consumption pattern. Lifestyle of consumers is an interesting characteristic which has well influence on consumption pattern in several established consumer behaviour literature. Expanding the analysis to include more lifestyle variables would provide marketing managers and researchers more incisive insights into the dynamics on consumption pattern and behaviour. Future studies should assess influence of lifestyle variables on consumption pattern and behaviour. 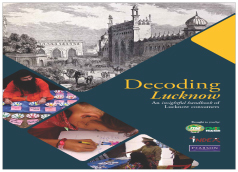 This book further provides richer insight on thorough understanding on what Lucknowites think of past, present and future of Lucknow, what values they have in their own life and how products and brands live in their life. The observations provide changing meaning of selected values in life such as: love, money, interesting and boring etc. Past image of Lucknowites presents two distinct shades: Nawabi and Simpleton. Today’s Lucknowites is embodied by a young executive who is passionate, ambitious, diligent, career oriented and focused. In future, Lucknowites will become more punctual, ambitious, work oriented, professional and progressive. They also will become more isolated and cocooned in their digital world losing their sense of community and togetherness. We find many differences in responses of younger generation and older generation on present, past and future of Lucknow. A sensible response emerged across all respondents that Lucknowites are at present traditional in heart but modern in outlook.